This case describes the treatment of a 22-year-old lady with Amelogenesis Imperfecta. 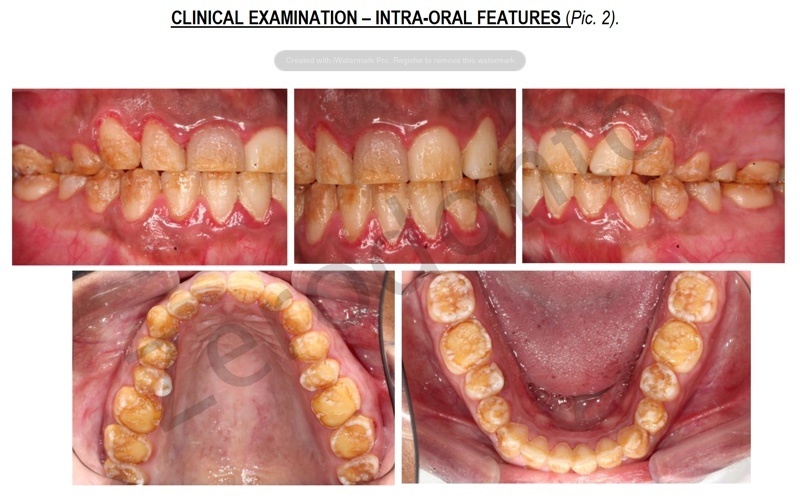 She also presented with a discoloured upper right central incisor with a history of trauma. Following diagnostic and planning stages in conjunction with endodontic and prosthodontic colleagues, the patient underwent a full mouth rehabilitation following a reorganised approach at an increased occlusal vertical dimension. 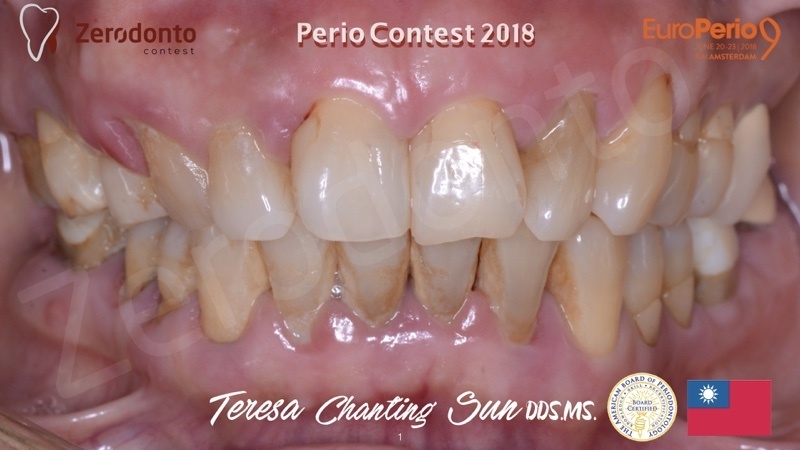 Non-surgical periodontal therapy and periodontal crown lengthening surgery was carried out for both functional and aesthetic needs. 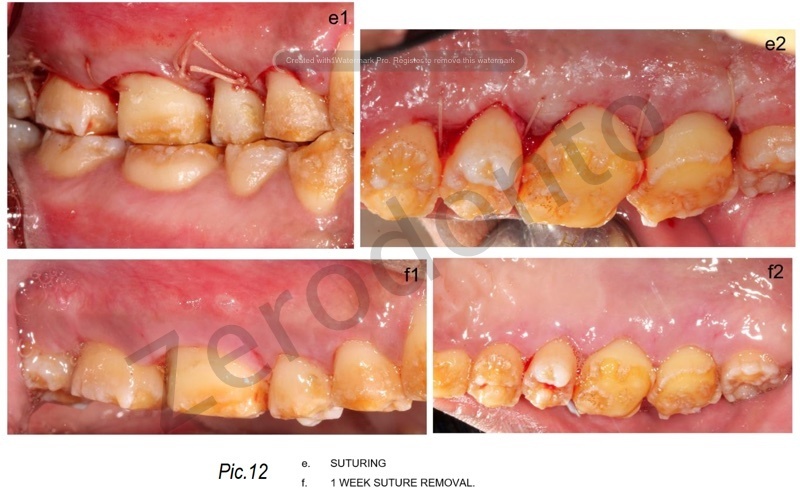 Endodontic treatment as well as vital and non-vital tooth bleaching was completed prior to an adhesive anterior composite resin reconstruction, while posteriorly conventional cast restorations were used. Prosthodontics. Dr. Robin Amanullah. Specialist Prosthodontist. UK. 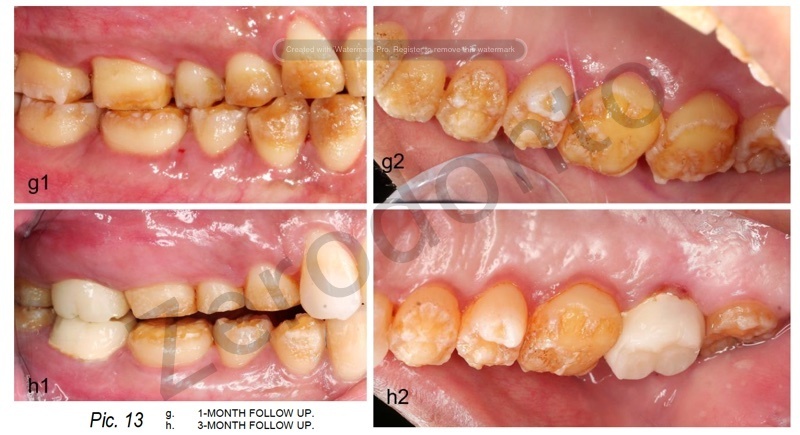 Non-vital/vital bleaching of aesthetic region and all restorative work. Brushed once to twice daily with an electric tooth brush using fluoridated toothpaste. No regular use of inter-dental aids or mouthwash. 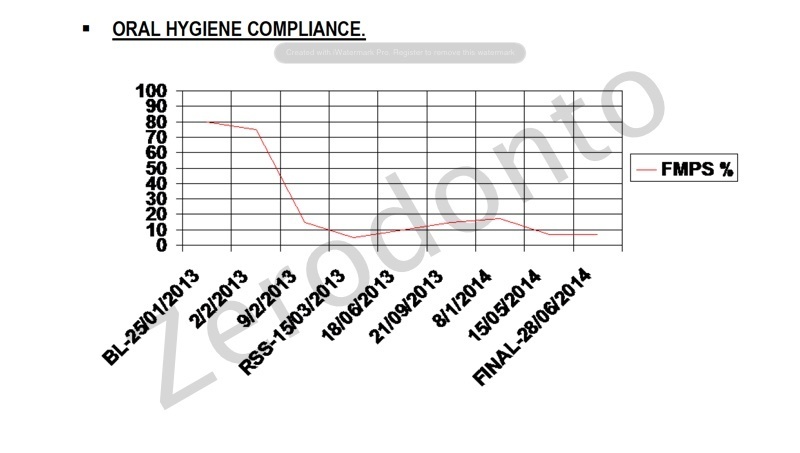 No family history of periodontal disease. Low cariogenic and erosive risk. 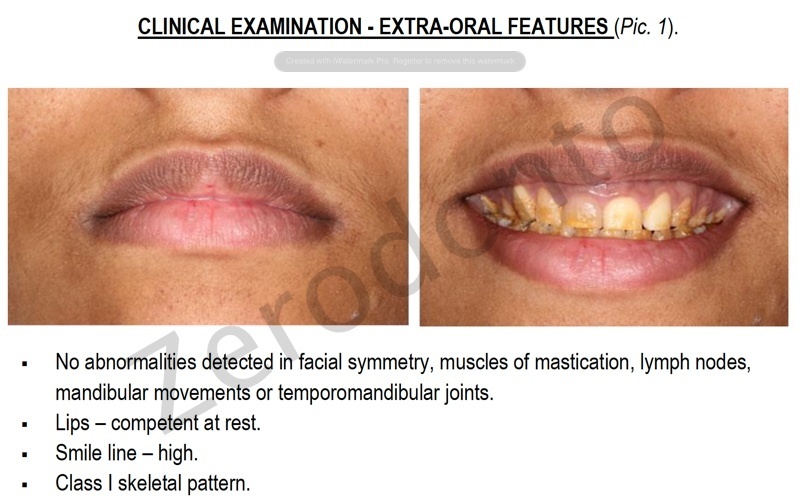 Racial pigmentation noted on attached gingivae. Keratinised tissue in upper jaw ranging from 5-9mm. Keratinised tissue in lower jaw ranging from 3-6mm. 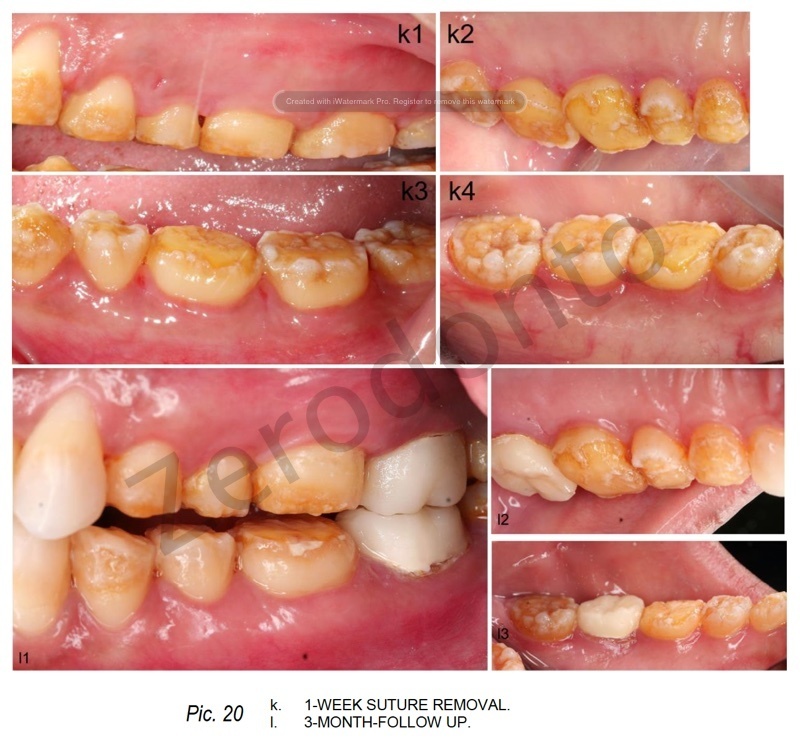 General tooth wear noted with mainly attritive component – enamel largely absent on occluding surfaces/posterior teeth. Class III incisal relationship (edge to edge). Centreline – coincident (to facial midline). Shimstock holds present across the arch. Retruded contact position (RCP) at 17 to 47. RCP not coincident with intercuspal position (ICP); horizontal to vertical slide in 1:1 ratio. 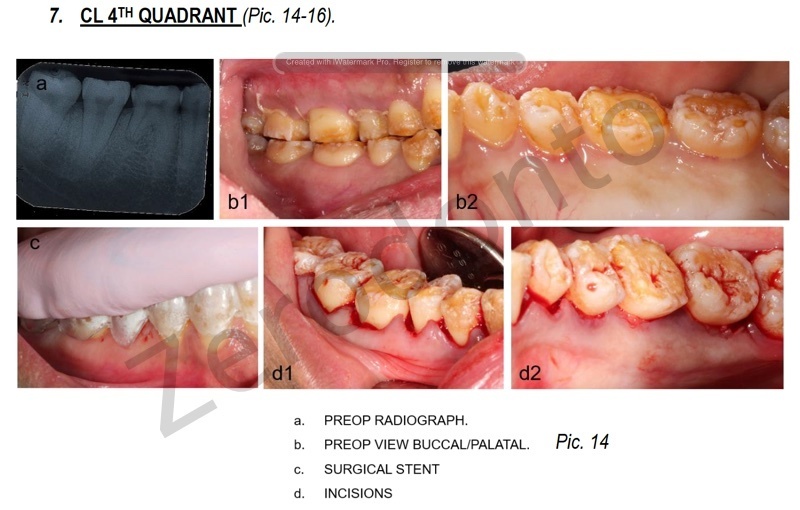 Periapical radiolucency associated with 11. Coronal radiolucent images detected 17(d), 26(m). 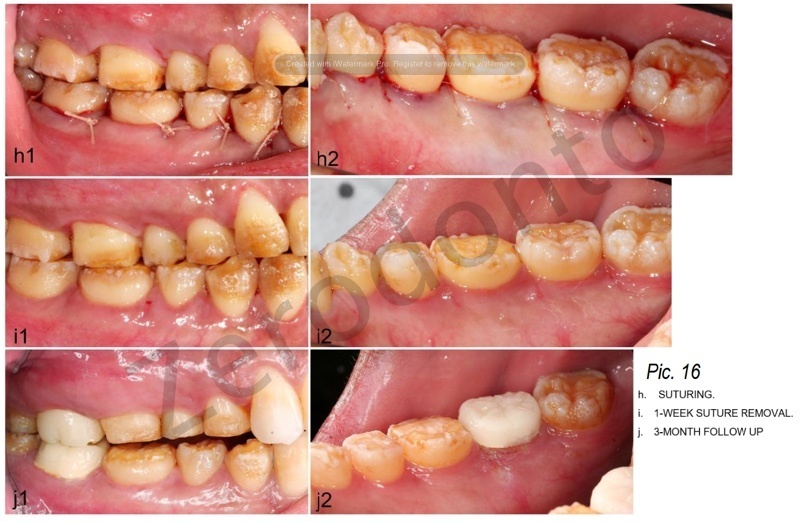 No carious lesions detected, just partial/complete absence of enamel at those locations. Shortened distal apical root form 46. EPT readings ranging from 7-11 on: 13, 12, 21, 22 and 23. 11 EPT reading of 80. Amelogenesis Imperfecta (AI) – hypoplastic. Generalised tooth wear with primarily attritive component and associated short clinical crown height. 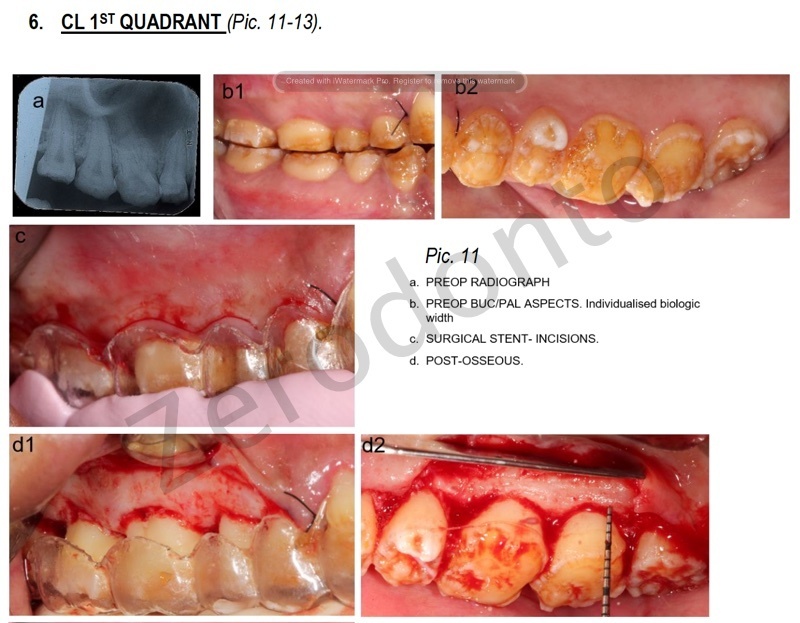 Chronic apical periodontitis associated with 11. Asymmetric gingival profile in the aesthetic zone. 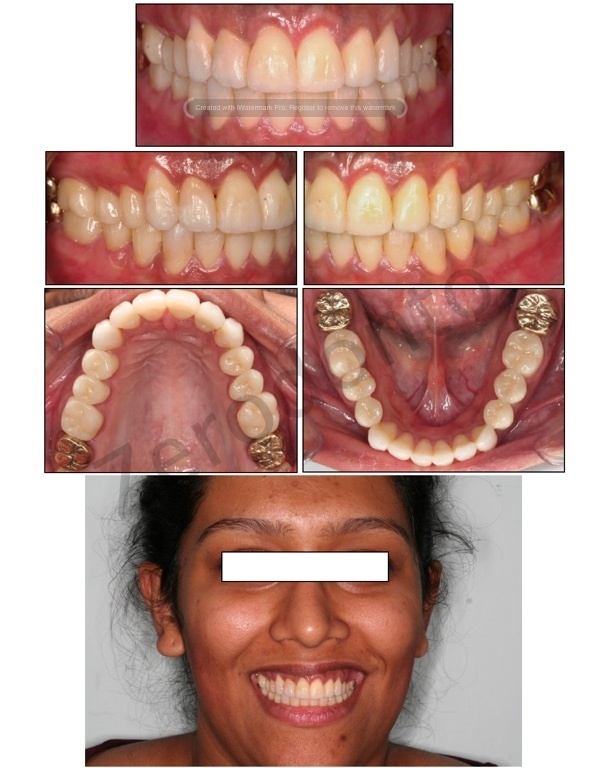 Patient being able to deliver self-performed plaque control efficiently on a daily basis. 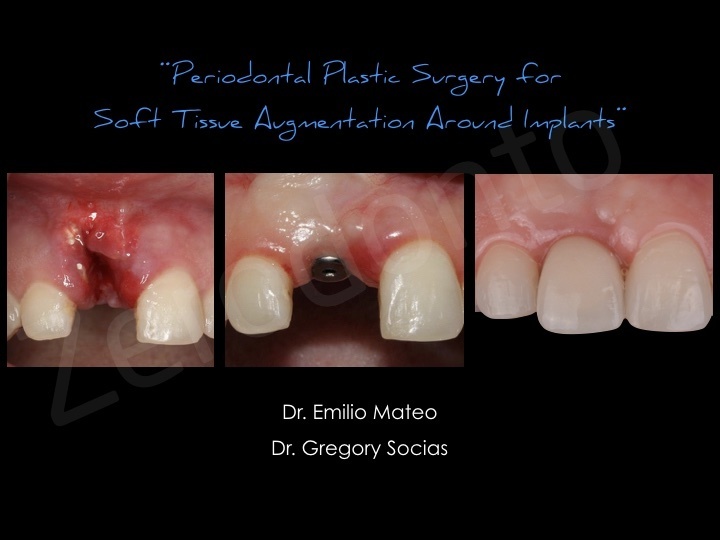 Establish aesthetic soft tissue profile with adequate crown height for reconstruction. 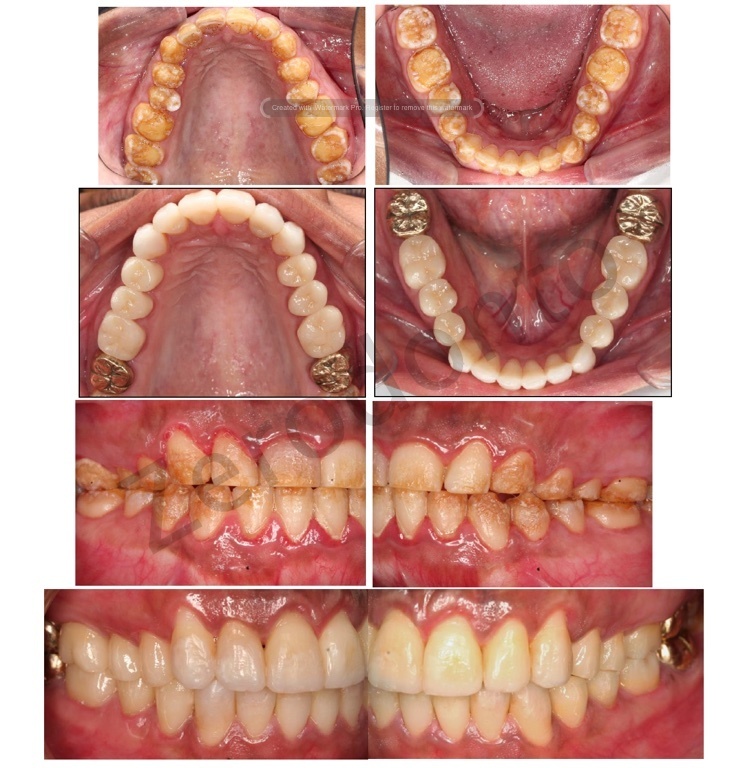 Restore form, function and aesthetics of dentition. 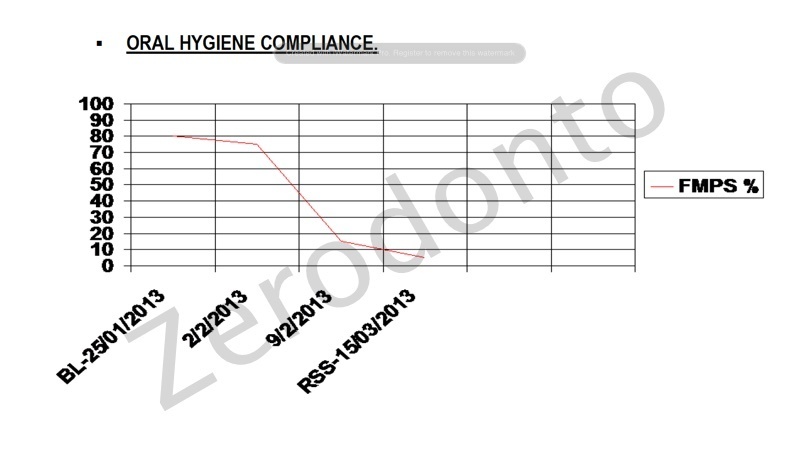 Formulate maintenance regime in conjunction with general dental practitioner. Oral hygiene support and advice. (Magnusson el al. 1984). Fluoride prescription according to caries’ risk profile. Prescription of desensitising agent (toothpaste). 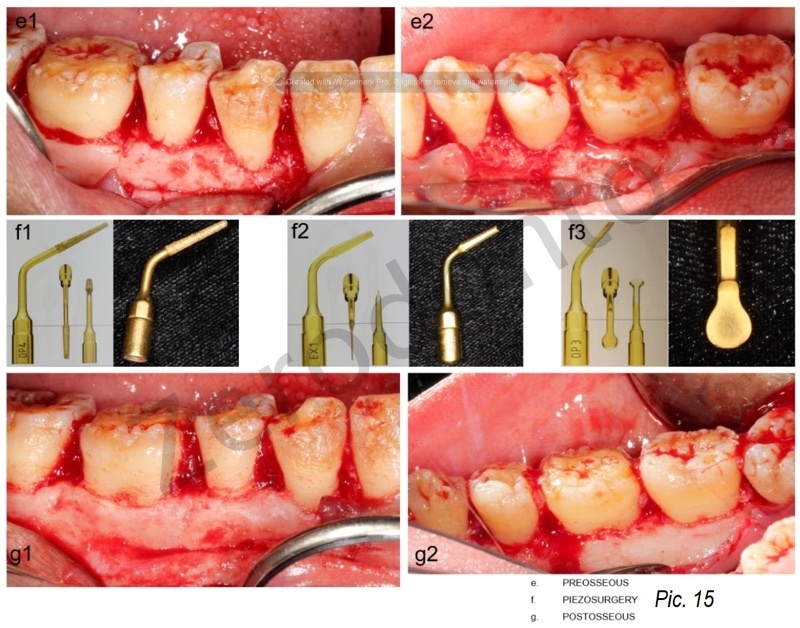 Supra/subgingival debridement of the whole mouth under local anaesthetics. (Lang et al. 2008). Reassessment in 10/12 weeks (Apatzidou et al. 2004, Badersten et al.1981). 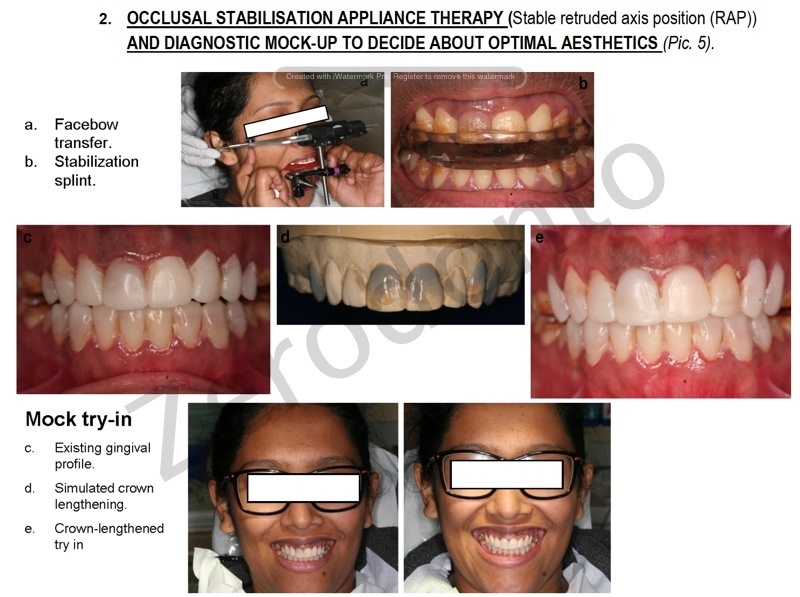 Occlusal stabilisation appliance therapy and diagnostic mock-up to decide about optimal aesthetics. 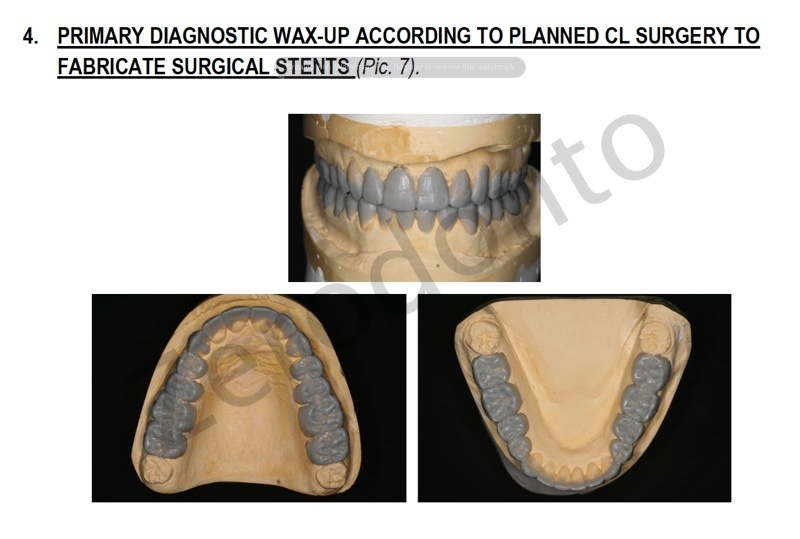 Primary diagnostic wax-up, planning of crown lengthening surgery, provision of surgical stents. 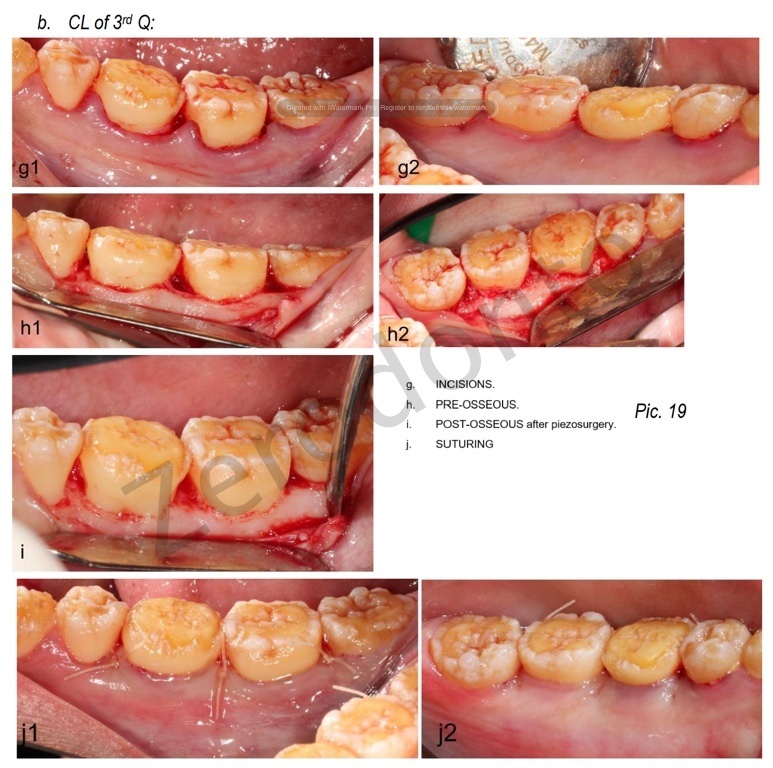 Periodontal crown lengthening surgery (CL) (full mouth except lower anterior sextant) determining the individual biologic width for each tooth (six points per tooth). (Bragger et .al 1992, Schmidt et al. 2013). Internal/external bleaching of 11 and vital bleaching (aesthetic zone). Full mouth diagnostic wax-up – for prosthodontic reconstruction. c) Reconstruction at newly stablished vertical dimension following previous diagnostics. (*) In planning phase, consideration was given to the option of reverting to cast restorations in case of failure. 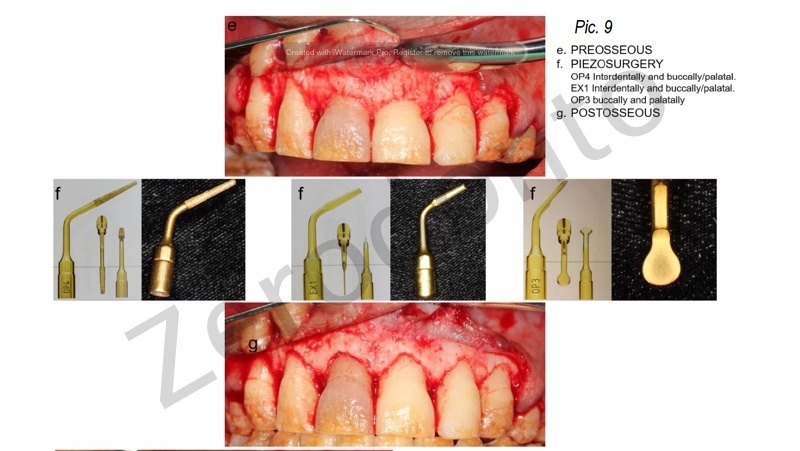 Stabilisation of posterior occlusion with holding stops. Definite wax up after new jaw relation records in retruded position. 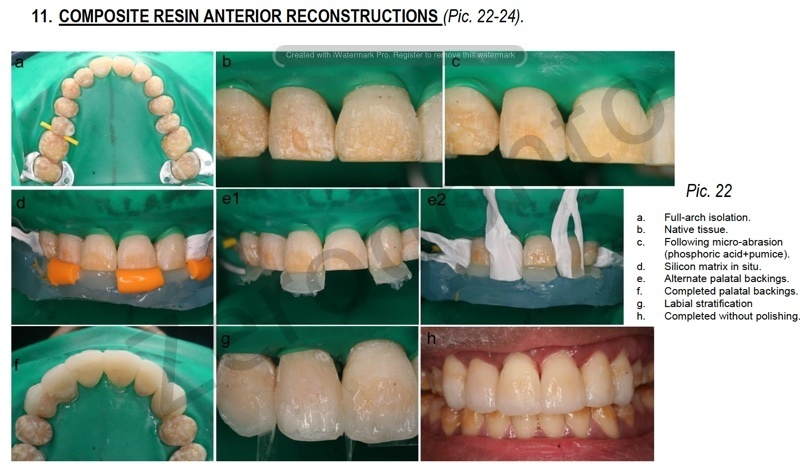 Provisionalisation of posterior reconstructions and testing phase. 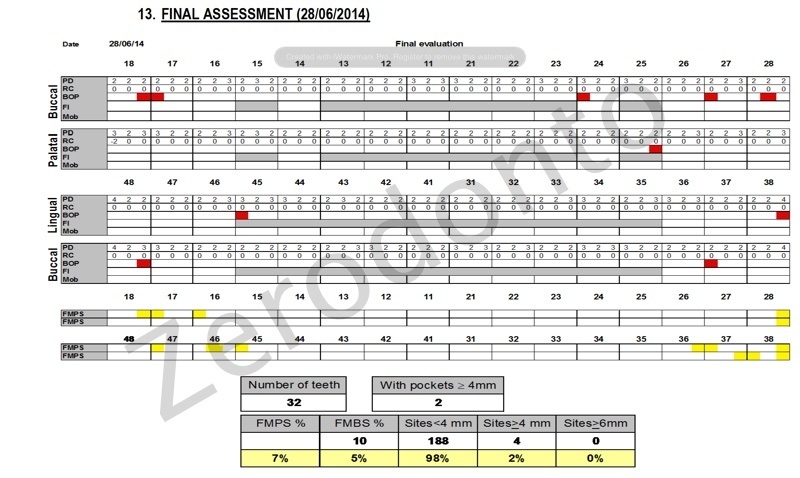 Inclusion in periodontal maintenance programme and recall intervals set according to periodontal risk profile. (Lang et al. 2003). Patient was offered options with and without aesthetic crown lengthening (re: upper anterior sextant); it was a high priority for the patient that aesthetic elements were optimized without compromising function. Once the different mock try-in were tested, she decided to have crown lengthening as needed. We suggested to extend CL more apically than needed on 15, 14, 24 and 25 for cosmetic reasons due to her broad smile. 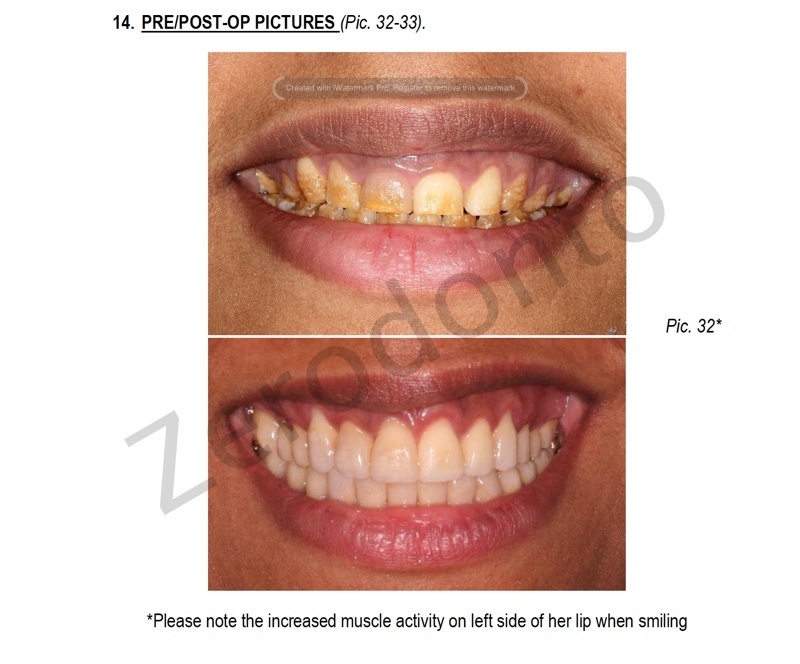 However, patient found her smile quite pleasant and harmonious just providing aesthetic CL from 13 to 23. Based on the patient’s wishes, we planned the rest of her treatment. At this visit, additional appointments were suggested for further refinement in the cervical margin of 23 and 13 reconstructions. However, patient did not wish to proceed as recommended as she was happy with the result and it was becoming increasingly difficult to take time off to be able to attend any appointment not scheduled in her original plan. 1. Apatzidou, D. A. and D. F. Kinane (2004). “Quadrant root planing versus same-day full-mouth root planing. I. 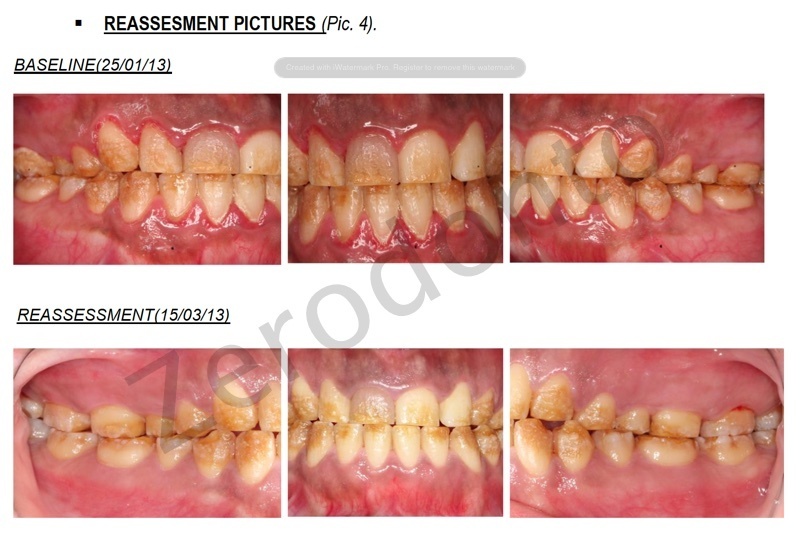 Clinical findings.” J Clin Periodontol 31(2): 132-140. 2. Badersten, A., et al. (1981). 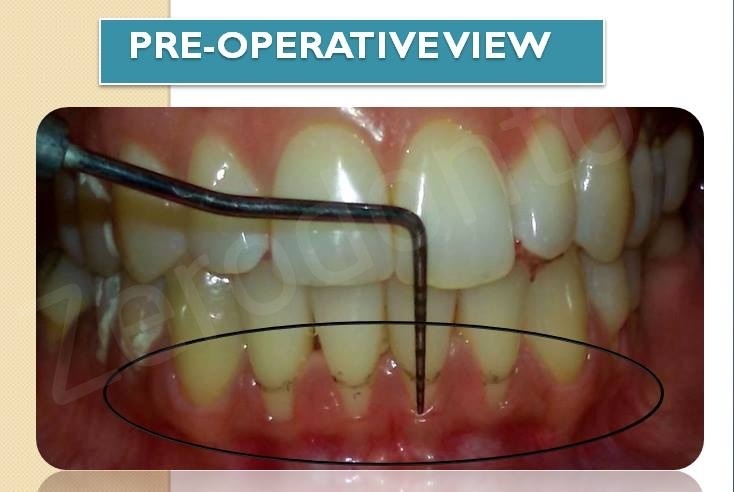 “Effect of nonsurgical periodontal therapy. I. 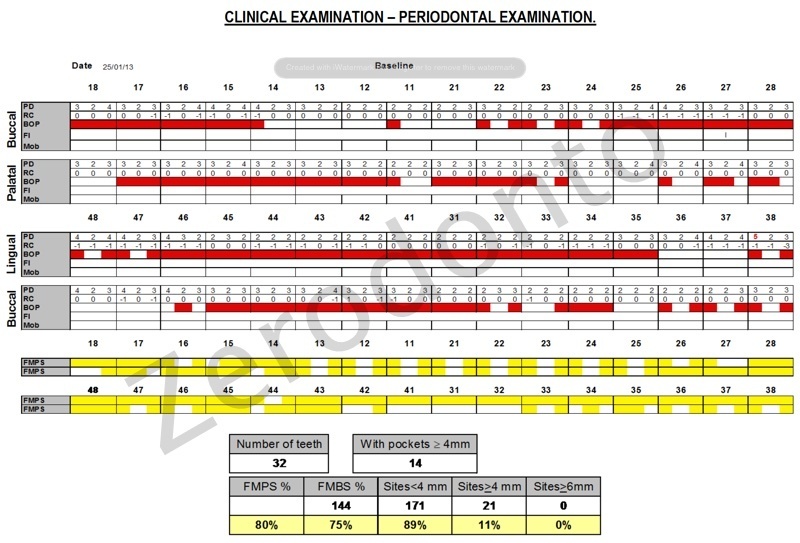 Moderately advanced periodontitis.” J Clin Periodontol 8(1): 57-72. 3. Bragger, U., et al. (1992). 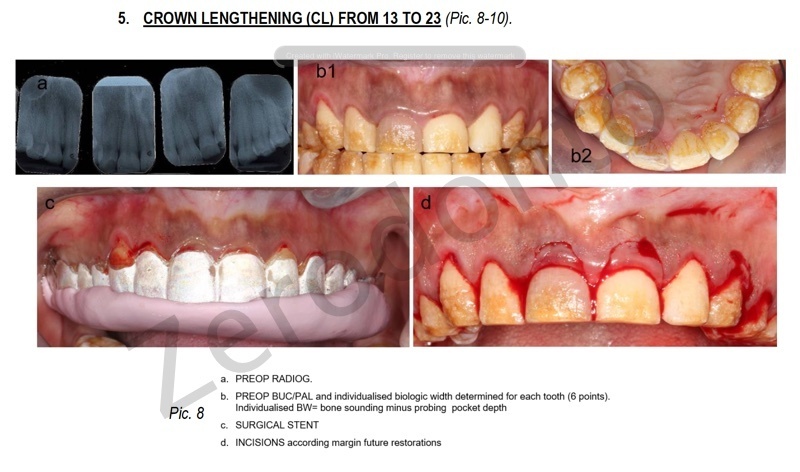 “Surgical lengthening of the clinical crown.” J Clin Periodontol 19(1): 58-63. 4. Chana, H., et al. (2000). 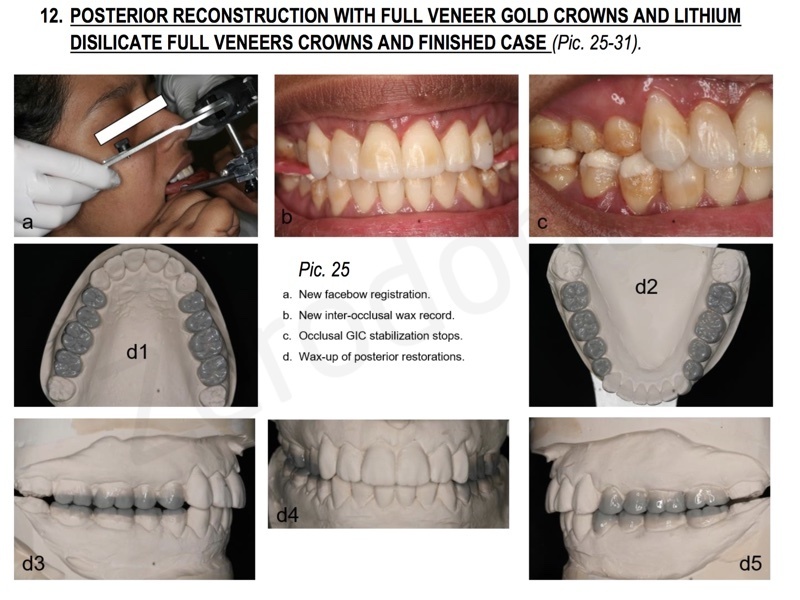 “Clinical evaluation of resin-bonded gold alloy veneers.” J Prosthet Dent 83(3): 294-300. 5. Gehrt, M., et al. (2013). “Clinical results of lithium-disilicate crowns after up to 9 years of service.” Clin Oral Investig 17(1): 275-284. 6. Gulamali, A. B., et al. (2011). “Survival analysis of composite Dahl restorations provided to manage localised anterior tooth wear (ten year follow-up).” Br Dent J 211(4): E9. 7. Lang, N. P., et al. (2008). 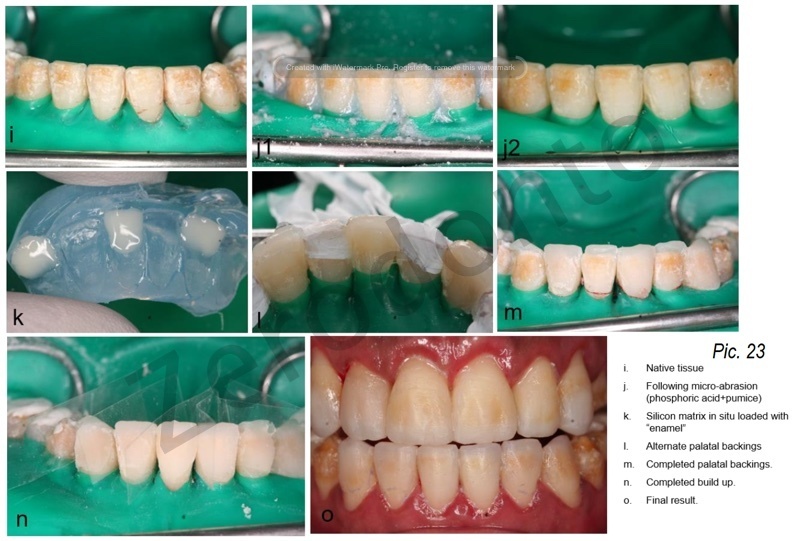 “A systematic review of the effects of full-mouth debridement with and without antiseptics in patients with chronic periodontitis.” J Clin Periodontol 35(8 Suppl): 8-21. 8. Lang, N. P. and M. S. Tonetti (2003). 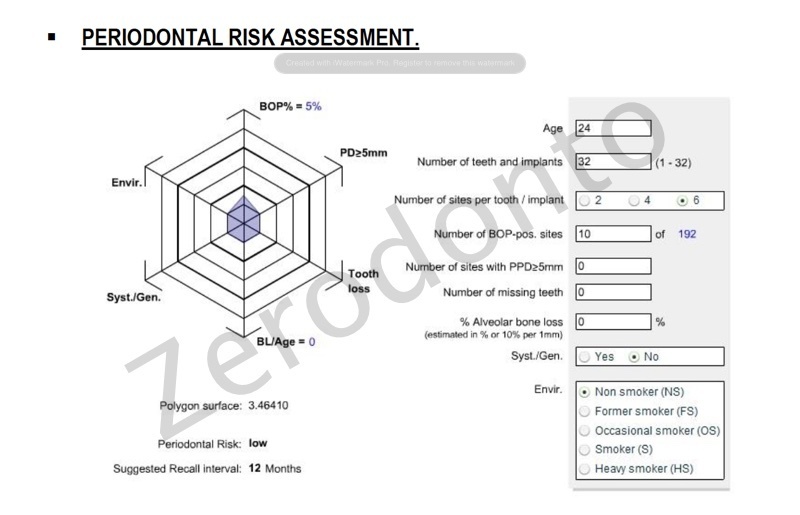 “Periodontal risk assessment (PRA) for patients in supportive periodontal therapy (SPT).” Oral Health Prev Dent 1(1): 7-16. 9. Magnusson, I., et al. (1984). “Recolonization of a subgingival microbiota following scaling in deep pockets.” J Clin Periodontol 11(3): 193-207. 10. Schmidt, J. C., et al. (2013). 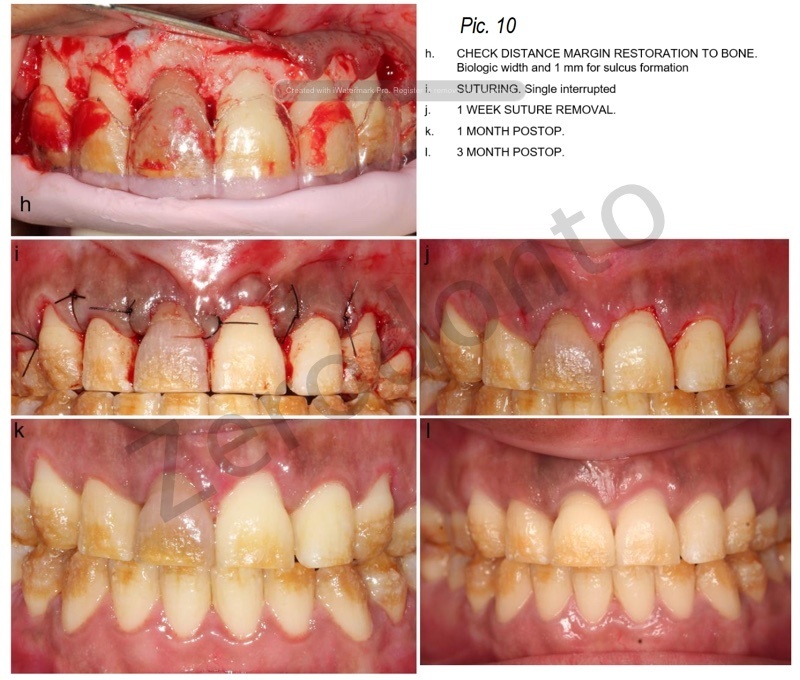 “Biologic width dimensions–a systematic review.” J Clin Periodontol 40(5): 493-504. 11. Wolfart, S., et al. (2009). 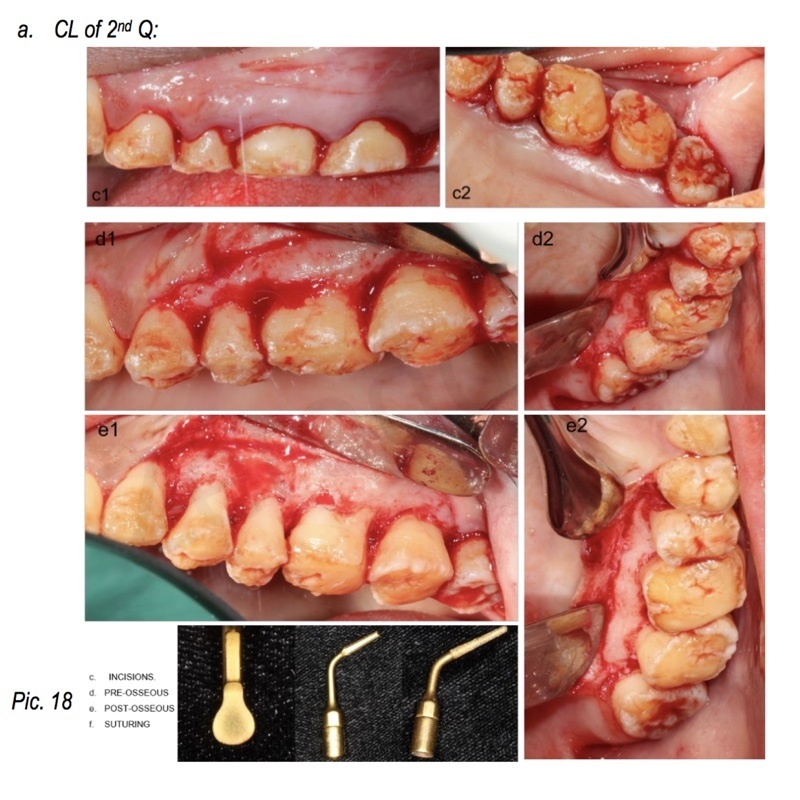 “Clinical outcome of three-unit lithium-disilicate glass-ceramic fixed dental prostheses: up to 8 years results.” Dent Mater 25(9): e63-71.